The Blog Why we LOVE the grid! We’re all about the Grid! But why do we LOVE it? • You can have fun scrapping! 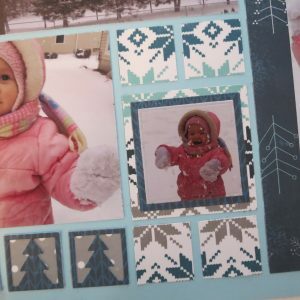 It doesn’t matter if you’re a die-hard hand cut Mosaic scrapper, totally into using just the dies, or maybe somewhere in between, you know how fun and rewarding making your scrapbook pages on the grid can be. Add in a few specialty dies, a good pattern and your own great photos and get to work creating pages you can be proud of years to come. 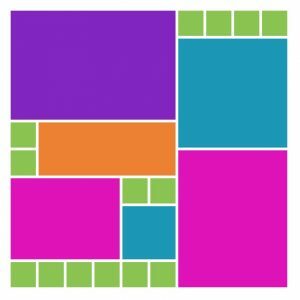 I know some find shortcuts trying to get the look of the grid without using the grid, but the results are often disappointing for the amount of time you have invested on your page. Using the grid lets you complete your pages quick and easy and have them shine! Take advantage of all the benefits of using the grids to improve your albums this year. In the layout today I’m going to include Tiny Tags, Forrest Borders 1” square die, layered die mats and a patterned paper collection. I begin with Sky Blue Mosaic Moments 12×12 Grid Paper and Pattern #173 which is a puzzle pattern. 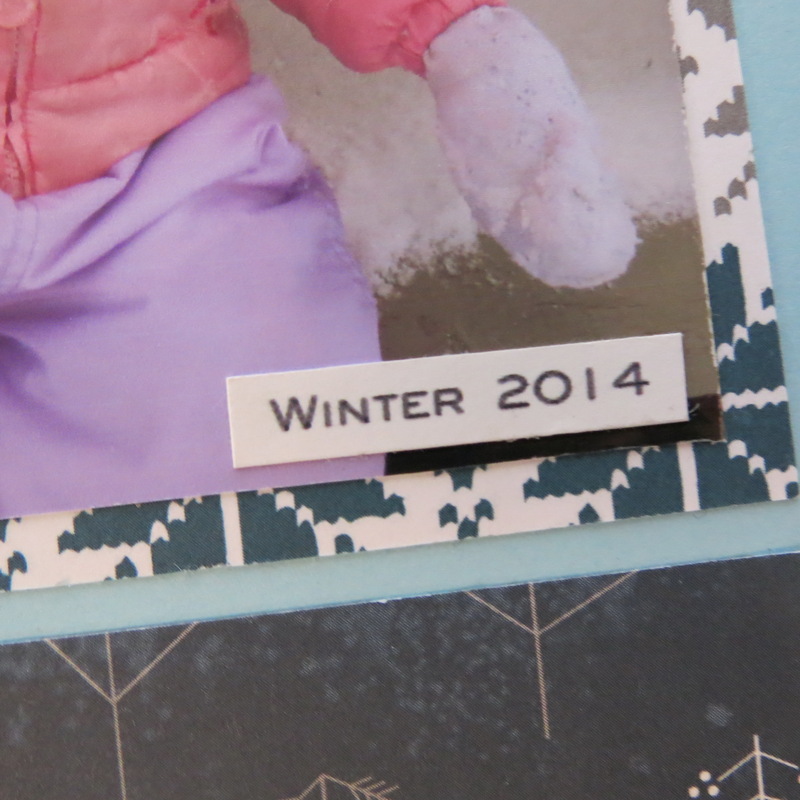 I add papers from the Echo Park Hello Winter collection. Picking just a few to work with was a challenge, there are lots of options. For mats I used the darker blues with lighter images I really didn’t want to cover it all up, so wider borders allow more to show through. I even used a darker navy knit-stitch paper to cut the trees out of and mounted them on the gray/white dot paper be the background. It reminded me of snow falling on an overcast day. 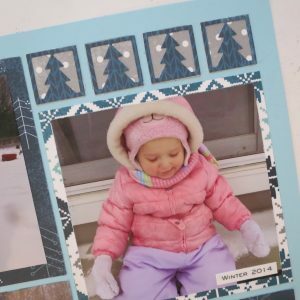 The Nordic print was chosen for my larger 4” square photo even though most is covered. I decided to include another spot for this patterned paper with a double mount photo that will show off more of the pattern and colors. Just a hint of the paper is really enough to carry the theme. 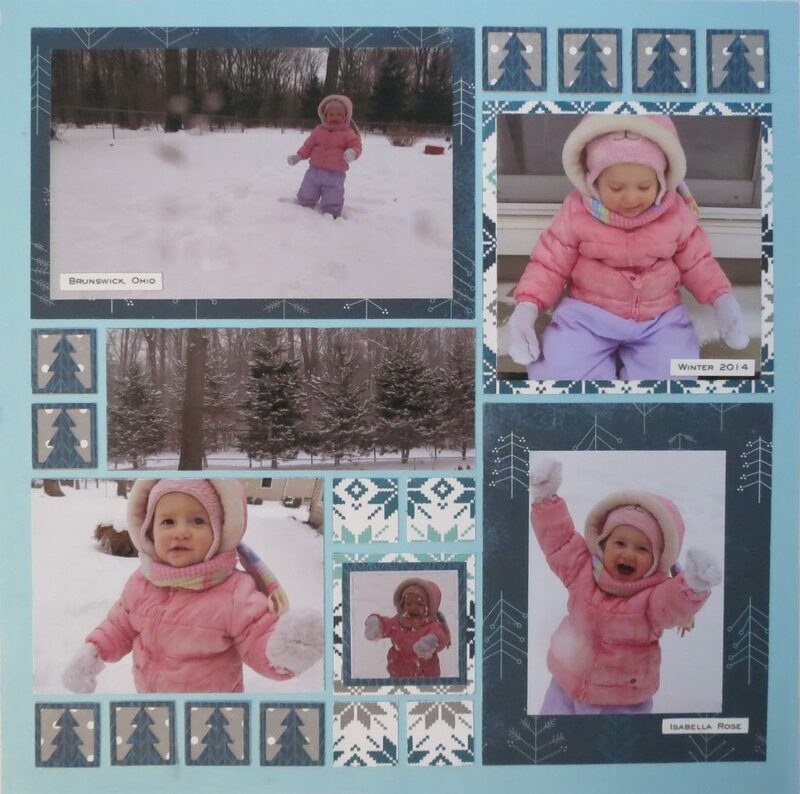 The skinny tree paper is a nice inclusion as I decided to include the photo of the snow-covered pines from the yard. They always look so magical covered in snow, standing like silent sentries in the yard. I didn’t include any journaling with this but found simple tiny tags placed on or near the photos conveyed the important details, the date, the place, and the person. I’d love to hear what you love about using the grid, be sure to share the pages you are doing with us online on our FB pages.